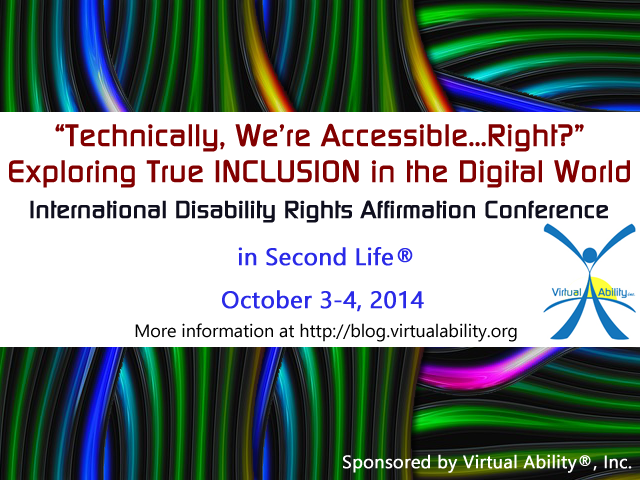 You're invited to the Oct. 3-4, 2014 International Disability Rights Affirmation Conference (IDRAC), sponsored by Virtual Ability®,Inc. This international conference will be held in Second Life®. The theme for 2014 is "Technically, we're accessible... right?" Exploring True Inclusion in the Digital World. Join colleagues, friends, and community members for presentations on web accessibility, advances in assistive technology, creating an accessible user experience, accessible gaming, emerging standards for technology, and more! Presenters from Spain, U.K., U.S., and Australia will join us at The Sojourner Auditorium on Virtual Ability Island within Second Life. Why don’t you join us, too? Keep your eyes on Virtual Ability's blog for more information!